YOUTH OF THE YEAR AWARD: Carol Wills, Jordan Tumes, Casey Connell and Stan Backhouse. IT’S been a busy start to the year for the Lions and Lioness Clubs of Tea Gardens/Hawks Nest. After a very successful Australia Day Breakfast at Moira Parade Park, the clubs held their local ‘Youth Of the Year’ dinner last week. 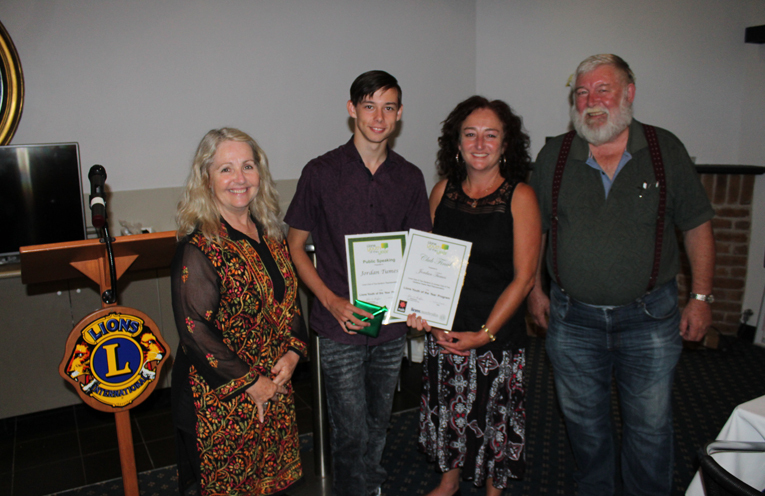 The judging panel of Carol Wills, Casey Connell and Stan Backhouse were pleased to award Tea Gardens local youth Jordan Tumes with the Club Final and Public Speaking Certificates after his interview and public speaking performance on the night. The judges were impressed at the interview by Jordan’s leadership, personality and general knowledge skills and his sporting and community involvement. In his two impromptu speeches, the Year 11 student from Medowie Christian School spoke on Global Warming and the legal drinking age. He then gave an entertaining outline of ‘Black Holes’ in his five minute prepared speech. Lions Club President John Hughes said, “Jordan is a very impressive young man who is always up for a challenge. Jordan now goes on to represent the Tea Gardens Clubs in the Zone final at Raymond Terrace on Saturday 17 February.